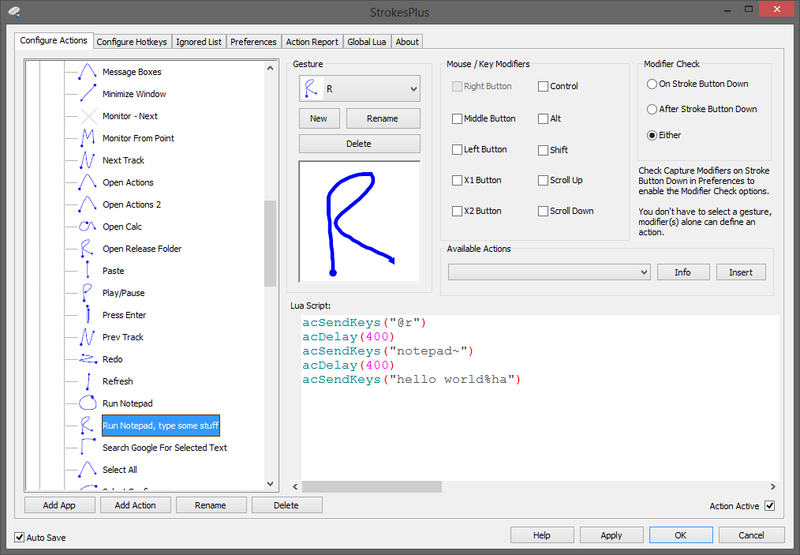 StrokesPlus is a mouse gesture recognition program similar to StrokeIt. It utilizes Lua scripting for actions and provides a great deal of power and flexibility. StrokesPlus is still a beta software but looks promissing. Settings written to StrokesPlus.xml in application folder. Promising app. I'm a big fan of StrokeIt and after first try of StrokesPlus I can say it is a great alternative. Key modifiers are nice additions. Having one xml of settings instead of many files is also a plus (though overall StrokeIt is smaller). Personally I will stick to StrokeIt as it does the job well and it would take a hell a lot of time to move all my actions to StrokesPlus (being lazy ). StrokesPlus was upgraded to release status. StrokePlus V1.1.8 available. There is now a 64-bit version too. Sometimes several versions a day are released. It is now at v1.2.6. - Added experimental feature Capture Modifiers on Stroke Button Down. This tells S+ to also capture modifiers at the moment the Stroke button is pressed. StrokePlus Launched a "portable" version. Except for the fact that I had to use HSTART in order to callit from a Batch File, it looks enough portable to me. ¿What do you think about Stealth? Added to the database. If it's useful for you, please vote @ http://www.portablefreeware.com/index.php?id=2372. lautrepay wrote: Added to the database. If it's useful for you, please vote @ http://www.portablefreeware.com/index.php?id=2372. Thanks for making S+ an official part of the database, guys! I never knew about this site until it showed up that S+ was getting referrals from here; I've discovered many awesome utilities thanks to you. Yes, the Pointless Fun category is just barely awesome, isn't it? @StrokesPlus: Thank you for stopping by! And please, keep StrokesPlus portable!